When one of these strikes watch out! The boys have been asking for cinnamon buns for a few weeks now and I was in the mood today to make them. I found the one recipe that I have but it takes about two hours before you can even think of putting them in the oven to bake. Yeah, I wanted to bake but not have it take up my whole day. 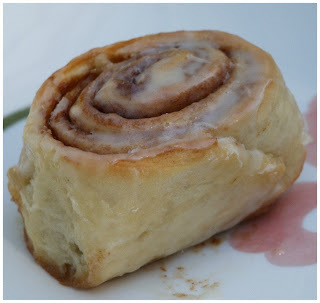 So… off I went in search of a good cinnamon bun recipe to try on Recipezaar. I shared four with the boys and they decided on the one we tried today. Now, my helpers bailed out one me. You see they found a show about the best roller coasters that they just had to watch. Anyway, the recipe from Recipezaar states salt in the fourth ingredient but there is no salt listed. I figured that it should be the baking soda that is added at this stage and so that is what I did. I did not use the icing recipe that was provided but one that I had on hand from my mom. The recipe was quite easy to make and the end results were outstanding! 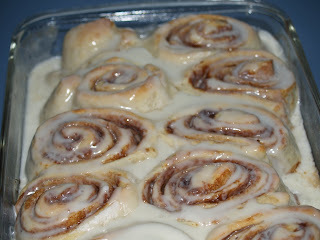 Grandma's Cinnamon Rolls original recipe from Recipezaar. Mix sugar and water together. Let stand 10-15 minutes or until dissolved. Add flour, baking soda, sour cream, vanilla, and 3 tablespoons sugar. Roll out on floured surface, to within 3/8 to 1/2 inch thick. Mix the brown sugar and cinnamon together and sprinkle over top the dough. Roll up, jelly roll fashion, cut into 12 slices. Place in greased 9x13 pan. Description: "A yummy breakfast treat!" Start to Finish Time: "2:00 hrs"
Per Serving (excluding unknown items): 212 Calories; 6g Fat (26.7% calories from fat); 4g Protein; 35g Carbohydrate; 1g Dietary Fiber; 14mg Cholesterol; 60mg Sodium. Exchanges: 1 1/2 Grain(Starch); 0 Lean Meat; 0 Non-Fat Milk; 1 Fat; 1/2 Other Carbohydrates. Serving Ideas : A nice cold glass of milk! Pour over top the freshly made Grandma's Cinnamon Buns. Per Serving (excluding unknown items): 73 Calories; 1g Fat (13.5% calories from fat); trace Protein; 16g Carbohydrate; 0g Dietary Fiber; 4mg Cholesterol; 1mg Sodium. Exchanges: 0 Non-Fat Milk; 0 Fat; 1 Other Carbohydrates. ** Can add a bit more cream to the mix if need to thin it out. ** Half & Half can be substituted for the whipping cream.